If it’s a fish stew you’re after, you’re going to love this one. Here’s my rendition of how to make a homemade cioppino with your fresh catch of rockfish or sculpin. And here’s the thing, the seafood broth that results from this recipe is full of ocean flavors that burst in your mouth. My recipe includes fresh caught rockfish and squid. And then, just like the original version, the tomatoes, fennel, bell peppers and onions all join hands to create this perfect Italian dish. 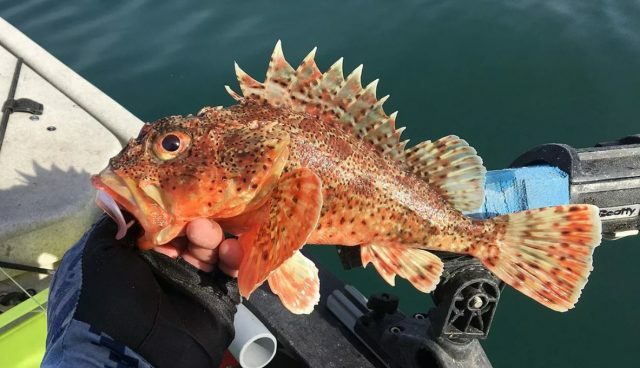 Why rockfish and squid? And, is that the only combination of seafood one can use? Of course not. The original dish was created by Italian fishermen at the fishing wharfs in San Fransisco. At end of their day, they would simply gather any left over catch from each other and create this stew. Whether it was clams, crabs, octopus or any variety of small whole fish, it all got artfully thrown together to create a hearty stew. In that light, my good buddy Tony Park called and said he had a few extra sculpin. My reply was, when and where can we meet? I also had a few market squid from a recent coastal squid spawn, and bingo, this cioppino was born. 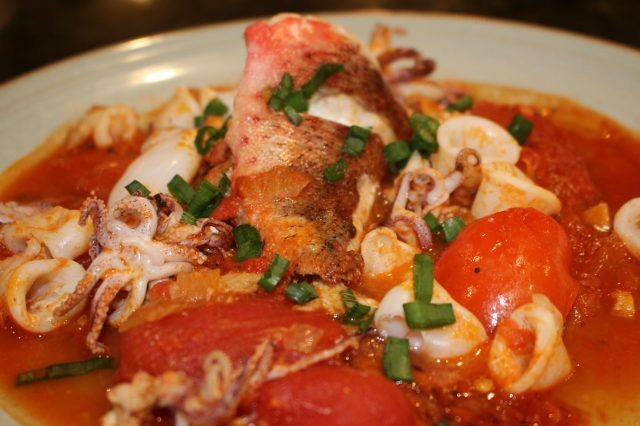 Believe me, once you learn how to make homemade cioppino, this Italian fish stew will always be part of your go-to recipes at your house. Start by heating the olive oil in a large casserole pan, and then add in the onions with a pinch of salt and pepper. Next add the red onions, fennel and lastly, the garlic. Allow this to cook over a medium heat for about 10 minutes. Now is the time to add the whole peeled tomatoes. After that, use a hand held grater and grate a whole tomato inside your casserole pan. Also, add the oregano and cup of white wine to finish the stew. Allow this to simmer for another 15 minutes. If your fish and squid isn’t prepared yet, then now is the time to do it. Next, start by adding the whole rockfish on top of the stew. Remember to add a lid on the casserole pan and thereby steaming the rockfish for 10-15 minutes. Now add the squid and cook only for another 1-2 minutes. Finally, serve in a plate and garnish with chopped parsley or green onions. Hope you love it!